I’ve been posting bits and pieces of our London trip on Instagram, and wanted to share a little more info behind the photos! 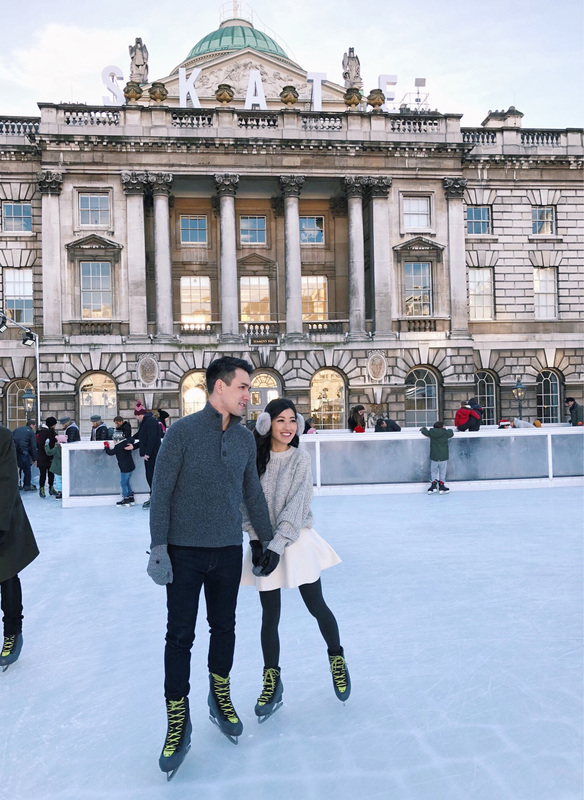 Nick and I have visited a few times before, so with some touristy activities out of the way, we planned to just wander and take in the beauty of the city during this time of year! I packed an old pair of faux suede OTK boots (reviewed here) and these rubber rain booties in preparation for lots of walking in damp conditions. This was basically my same uniform while visiting last year! For both of these boots, you can size up and put in thicker insoles from the drugstore, since they don’t come with much cushioning. We rode the London Eye during a previous visit – as someone wary of heights, once was enough for me! We did enjoy views of it while strolling along the Westminster Bridge or Royal Air Force Memorial (where the above IG was taken), especially at sunset! Last year we also enjoyed strolling through Belgravia with its grand homes and cute storefronts like this cheese boutique and this floral shop. There’s two UK-based brands that Nick and I try to check out when we visit – Ted Baker and Topshop! Both are priced a little better there compared to in the US, plus you can potentially get a VAT refund. A long plaid jacket has been high on my list – it’s very on-trend right now, yet the style itself is classic. This jacket (the weight is like a jacket and not a heavy coat) was one of my favorites at Topshop but a little roomy on me in 0 regular and the sleeves would need shortening. However, it just became available online in petite sizing (with free shipping & returns)! A 0 petite should suit someone my size without alterations. While shopping at Ted Baker, we ran into none other than founder “Ted” (Ray Kelvin) himself who was quite the quirky one! The story of how he built the brand from the ground up is nothing short of impressive. I seem to have some random luck while traveling encountering founders of brands that I shop at! I love Ted Baker’s sleek wrap coats, and think the longer length can actually be very flattering on petites. Note their signature wool-cashmere style (pictured above) available year after year is on the thinner side, however I own a seasonal version of that coat in a thicker, nubbly textured fabric (pictured below). This thicker version comes in navy wool as well as a burgundy plaid! I kept one eye open throughout this trip for a little handbag souvenir. I’ve been coveting a small or medium Chanel Boy bag for years, but the right leather, hardware, and color combo has always escaped me! 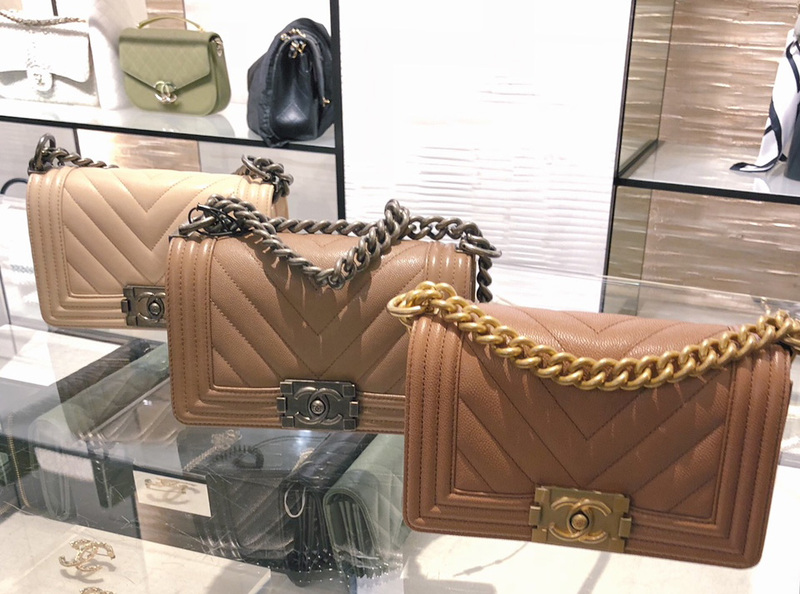 With Chanel’s global price adjustments last year, the prices in EUR are no longer as favorable compared to buying in the US (just a slight difference, factoring in the VAT refund). Based on exchange rates when we visited, prices may have been a little better in UK pounds than EUR. Out of the various Chanel boutiques we browsed around London and Paris, Harrods actually seemed to have the best selection across their two floors of Chanel. For those interested, I’ll be doing a separate review post of the styles I tried on! We had a great experience renting an apartment last visit, but this trip was last-minute so there weren’t many rentals left. We booked the Rosewood London hotel in Holborn – the building architecture is beautiful and the location is convenient, although I felt our room was a little pricey for what it was. Nick loved the hotel bar, “Scarfes,” and there was another bar decked out in a cozy lodge vibe that we didn’t get to try! We got several recommendations for afternoon tea at Rosewood, which is supposedly very sculptural and modern, but we ended up doing a more traditional one this time. On the topic of tea, those interested should check out the extensive list of suggestions we received, and book your reservations in advance! We got a last-minute slot at Fortnum & Mason around 7pm. 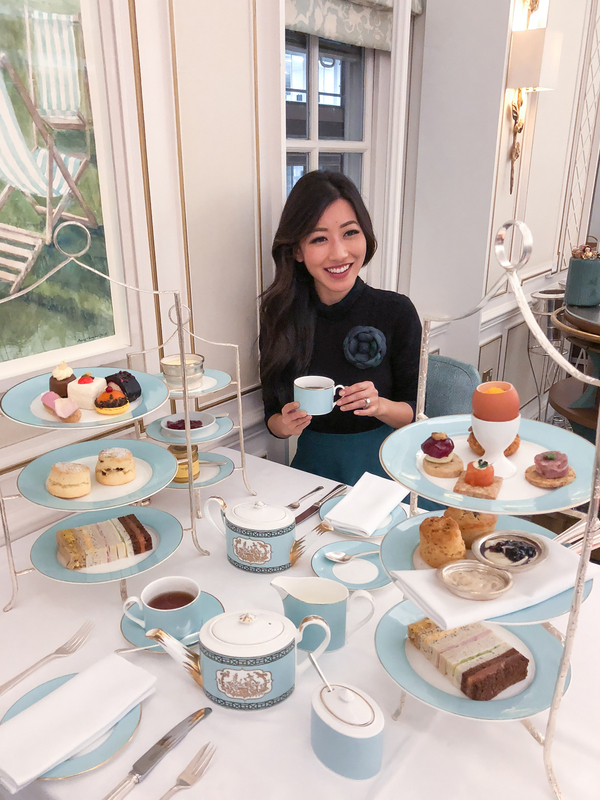 Their blue china sets are gorgeous, their tea list lengthy, and we loved the choice of traditional sweet versus savory only (I am all about the savories). The savory scones were scrumptious and you can typically get refills on whatever you’d like (which seems to be the norm for tea in London; not the case in the US)! However, they did not have enough for seconds on certain items since we were the last seating of the day, so I’d recommend an earlier slot at any tea place for that reason. We also loved browsing the F&M department store afterwards and picked up several souvenirs and little food items! A lot of you recommended Dishoom, which we did enjoy before, but the wait was hours long so we went to Masala Zone for a quick Thali fix. We love Thali-style meals where you get several little Indian dishes + bread or rice served on one platter. We also ate at Hoppers, a bustling Sri Lankan restaurant. We tried the bone marrow curry and lamb roti dish, which was roti bread cut up and stir-fried like noodles. Both were very flavorful but on the heavier side. It was cold and damp our entire visit, which had me longing for hot noodle soup! We came across an Ippudo which didn’t look busy, however the little Kanada-Ya ramen shop across the street had a line down the block! Cold be damned, we got in line and the ramen turned out to be delicious … flavorful with good noodle texture, and didn’t leave us bloated with sodium like ramen usually does. We also loved warming up to the simple goodness of udon at Koya Bar. They serve hot Japanese breakfast, too! We had to visit the decked-out Peggy Porschen cake shop after seeing it all over Instagram, but made the mistake of going mid-day. It was swarming with ladies trying to get a good ‘gram of their adorable snowflake lattes and cakes, so I’d suggest going earlier to avoid a crowd! In the winter, this terrace restaurant (opens early for breakfast and serves afternoon tea) gets decorated into a cozy little wonderland with heat lamps. It’s in The Bloomsbury hotel, which also has a sharply-decorated bar (The Coral Room) and a darling lobby sitting area! After a few days in London, we hopped on the train to Paris for a couple of nights. Can’t wait to share some more photos and shopping reviews from the trip! Love love love your travel posts with beautiful pictures Jean! I found your previous Hawaii/Maui post so helpful when I traveled last month. I really enjoy the beautiful photos from this travel. Thanks for sharing! Aw thanks for your feedback!! Hope you enjoyed Hawaii ~ I’m itching to go back! Hi Jean, I like the top with golden dots and black bow ties. Where did you get that. Thanks and I love your blog. I loved browsing through all these photos from your trip to London! It sounds like it was a blast. And how cool that you got to meet Ted Baker himself! That must make wearing pieces from the brand so much more special. Oh, what a delightful trip it seems you had! And all of the outfits are SO pretty! Your trip looks fabulous! You hit all the right spots in London and it looks like you had a beautiful time! Throw blankets on chairs, wow. Side question – do you run into noodle restaurants with a gluten-free option? I love soup and chow mein used to be my jam, but now I’m stuck with rice noodles. I rarely see that option offered : / I wish more noodle joints would include that! Jean, what are the outfit details for the red skirt you are wearing under the “Where We Stayed” section? It looks beautiful! I’m studying abroad in London this summer and I cannot wait to experience this! We were just in London, too! But so funny to see how different it looks with a four-year-old-year-old in the mix, haha! Also, you have more style in your pinky finger than I do in my whole body! Nice. Which camera you used to click them . They are good picture with colour and light. Most of these were taken on my iphone! Can we PLEASE TALK about that RED SKIRT though? Haha it was a find at Express out of all places! 1. you two look gorgeous. Omg, you guys are so cute! Like I can’t get over it!! London is definitely on my list of places to visit. I always trust your travel guides so I’ll definitely refer back to this in the future! How amazing are these pictures! It looks like it was a wonderful time! Wow! Bookmarking this for future London adventures! Looks like so much fun! I have the same Ted Baker jacket! Love it so! hi jean! i just tried on the SM rainboots and they look so good on. I scouted ebay for hoping that I might find it cheaper there and noticed that J.Crew actually has something very similar. It’s the J.Crew Matte Black Chelsea Rain Boots and I’m curious about the fit now. Was wondering if you’ve ever tried it on. Hi Annie – I haven’t tried the J.Crew ones, but the Sam Edelman ones are priced lower! It sounds like you had an amazing time in London! The photos are gorgeous, too! Hi Jean, Thank you so much for the great travel recommendations and beautiful photos. How do you manage to take those lovely photos with both you and Nick in the photos?! Do you have a travel companion who happen to be a great photographer? It’s difficult to do European city trips and carry tripod so I always wonder how you manage to get beautiful couple photos. Thank you so much Jean and Nick. The blog post is very helpful! Wishing you a blessed 2018 filled with peace and joy. 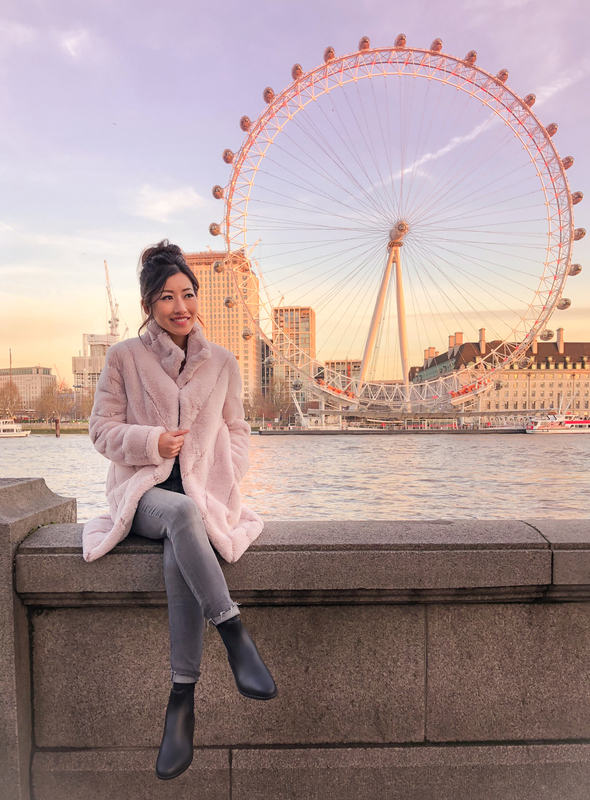 Loved reading about and seeing your photos of your London trip! Kanada-Ya is my favourite place for ramen in London. Can’t wait for your Paris post! WHERE IS THE RED SKIRT FROM? Jean I just loved this post . London is my favorite city . The city just speaks to me ! You give a fabulous tour , having never been to London in the winter you showed some great spots to visit ! Love the photographs in this post! Your outfits are just gorgeous and the writing style was really engaging to read! I found your website whist randomly browsing Facebook for Fortnum & Mason as I’ve just bought their Christmas Eve hamper (currently on sale.) I’ve had tea and cakes there on a few of occasions at the cafe on the ground floor where they sell their tea and coffee. I didn’t know they did afternoon tea like The Ritz down the road (50 pounds and all you can eat/drink but they don’t tell you that!) The tea and cakes me and my Japanese friends had were very nice but a bit expensive, I suspect the afternoon tea option would be more cost effective especially at the end of the day after a hard day’s shopping. Even though I’m on a low income because I’m disabled, I’m slowly falling in love with Fortnum and Mason because their tea and biscuits are delicious and not all are expensive but also because the staff, especially the CEO who bothered to answer my questions, treat me nicely. I live in Reading so next time I got to London (and have the spare money) I’ll give it a try. If you travel a lot then I highly recommend Verona and Juliet’s House and my sisters worked at The Pangkor Laut Resort in Malaysia and The Muse Resort in St Tropez. I also recommend visiting The Savoy Hotel for a Dry Martini at The American Bar. Erik makes the best Dry Martinis! These are great travel highlights! Love all your outfits, how large was your suitcase?! Hi! I just recently found your page – and I’m absolutely obsessed! Was curious to know with all the traveling you do, what your favorite walking shoe that gives you enough comfort and support all day, and of course doesn’t make you sacrifice fashion? Hi Jean! Thank you so much for posting about your London trip. I was there for Christmas last year and I must say that London is just utterly beautiful. Your photos and recommendations made me miss it more! I hope to try out the afternoon tea like you’ve had when I come back there! Going to London the first week of April and trying to get outfit ideas. Will the weather will still be as cold and damped? I want order “winter” clothes now before they become unavailable in March. Any suggestions? Thanks! Love your posts!!! Hi Wendy – I’ve gone in April and it’s definitely not as cold as in December, but you’d still want to bring layers like scarves, a trench coat, and sweaters to layer with! Hi Molly! I got it from Express but last year … it’s the wrap maxi skirt and they bring it back in different colors and prints. Do you know any stores where I can find EXTRA petite lingerie for my girlfriend? She is smaller than you. Thank you!